This is a professional version of our PipTick Currency Strength Indicator. 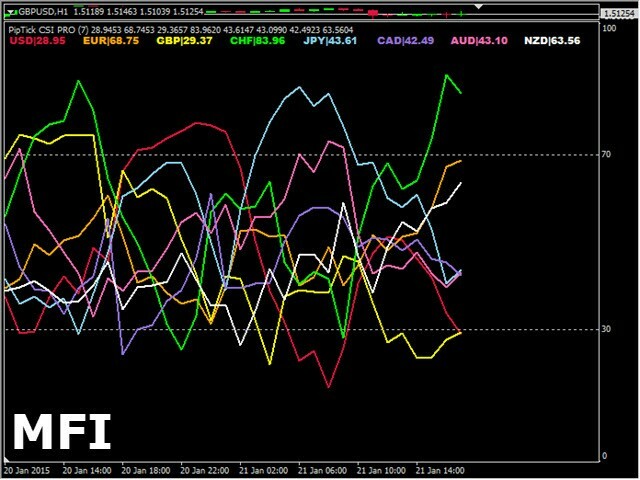 Knowledge of the strength and weakness of each currency is vital for every forex trader. Our currency strength indicator measures strength of eight major currencies (USD, EUR, GBP, CHF, JPY, CAD, AUD, NZD) by using several popular indicators. PipTick CSI PRO shows you in a simple and quick way whether the currency is strong or weak. Furthermore, you can also see when the currency is oversold, overbought or in "normal area". 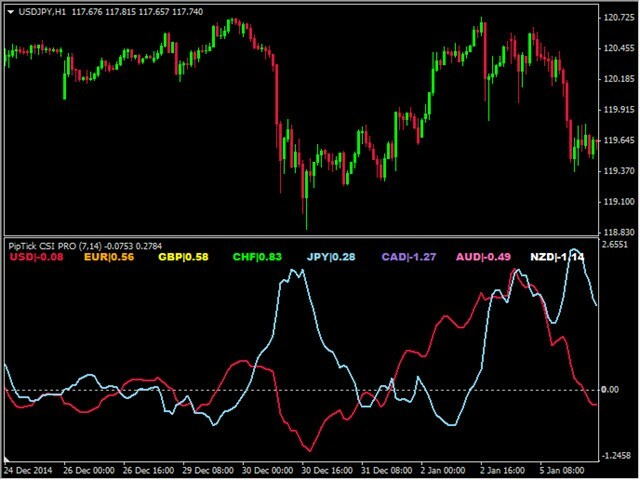 The indicator can measure the strength and weakness of currencies by four method. 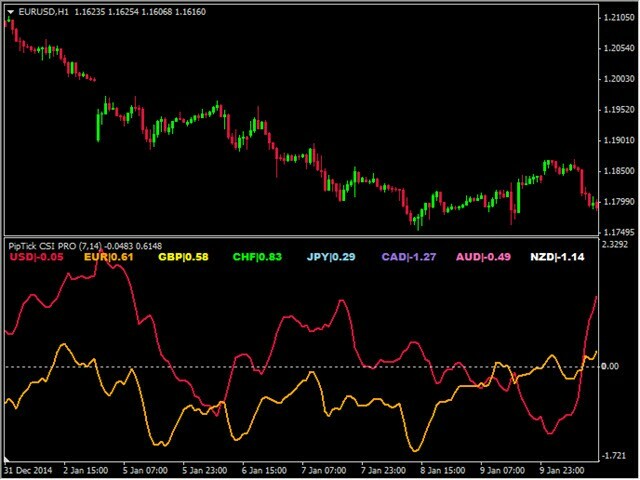 The indicator is calculated from 28 currency pairs and works on every MT platform. PipTick CSI PRO uses only 7 currency pairs for calculation of the rest of 21 pairs. 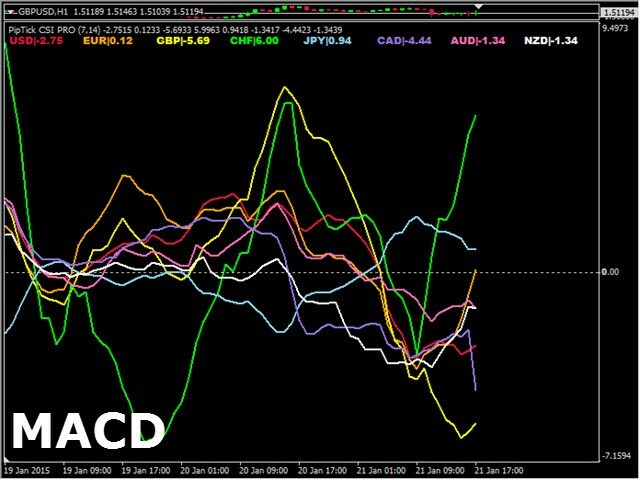 For correct working of the indicator you need only these seven pairs in your MT platform: EURUSD, GBPUSD, AUDUSD, NZDUSD, USDJPY, USDCHF and USDCAD. 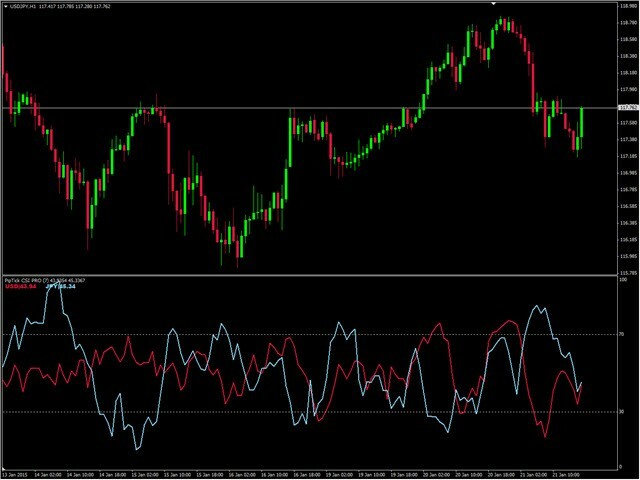 Because our PipTick CSI PRO is based on the well-known indicators, its interpretation is very simple. 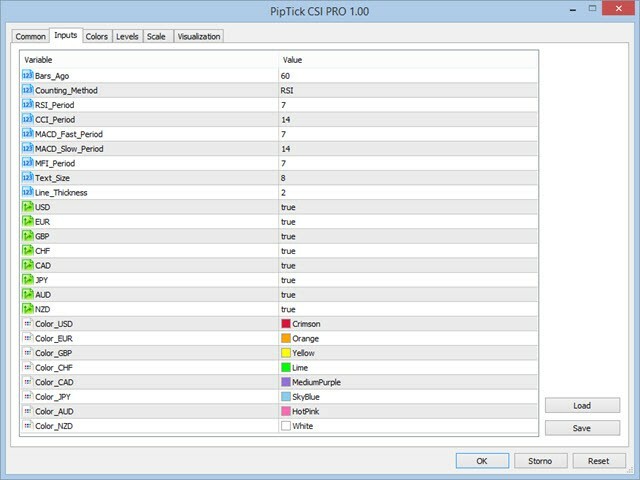 How to you use the PipTick CSI PRO? Buy strong currency and sell weak currency - Trend Following strategy. For example, if you see the EUR is strengthening and AUD is weakening, buy EURAUD currency pair. Do not trade if one of currencies is overbought/oversold. 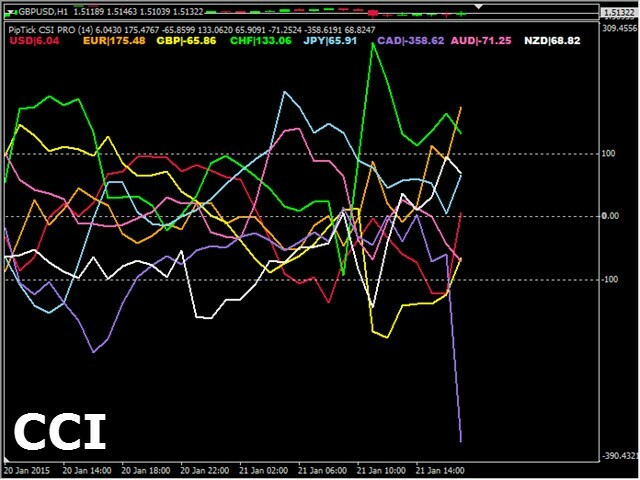 Sell strong currency and buy weak currency - Counter Trend strategy. For example, if USD is overbought and JPY is oversold, sell USDJPY. You can achieve great results if you use overbought/oversold concept of currency in conjunction with Price Action or Candlestick patterns. All you have to do is wait for overbought/oversold of one currency, followed by drawing candlestick pattern like hammer or shooting star. Of course, this is just one of thousands of possible ways of using of our currency strength indicator. You can use this indicator for long-term, swing, intraday or even scalp trading. It is possible to use PipTick CSI PRO for manual backtest as well. 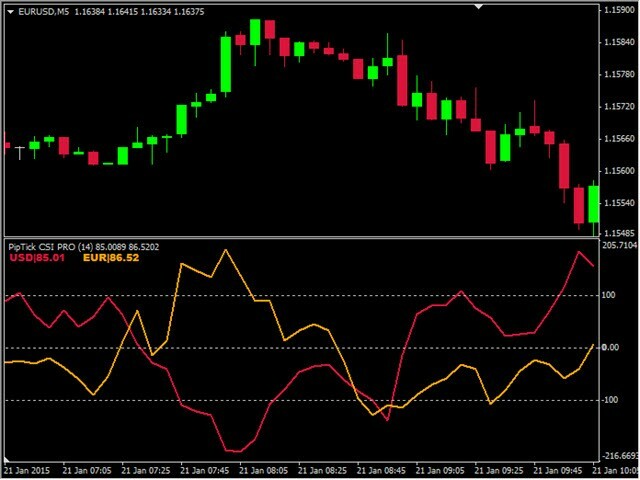 All you have to do is set parameter "Bars_Ago = 0" in indicator settings and download historical data for seven currency pairs which our indicator needs to calculate. PipTick CSI PRO is available for MT4 as well. For more information, visit the PipTick CSI PRO product page. This is a tick counter that doesn't auto update. To update it you must continually switch timeframes, sometimes 50+ times. 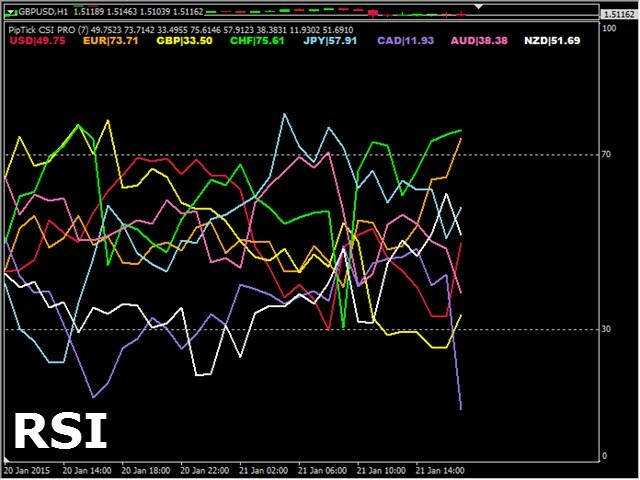 There is no way to get an accurate view of where currencies are heading in real time with this indicator. Added parameter for Automatic Prefix and Suffix search. Sometimes it happens that MT5 provider has the prefix / suffix defined but doesn't use them. For those cases, set Automatic Prefix and Suffix to False.